How Do You Secure An Entire Residential Neighborhood Well? Posted on: In: Blog | Comments Off on How Do You Secure An Entire Residential Neighborhood Well? Neighborhood security is a major concern, not only for the people living in a given area but also for real estate sellers that want to showcase a property’s value, and for potential buyers that are looking forward to settling down. The slightest sign of existence of crimes such as vandalism, burglary, etc, in a given area can see serious potential buyers bolting in other directions. This also has the inhabitants fearful for themselves and their family’s wellbeing. People living in areas that have recently experienced increased criminal activity levels can improve this situation in a number of ways. Here are some tips on how to enhance security in your neighborhood. 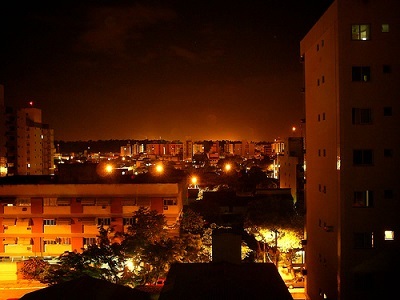 We all know that most crime happen during the night as darkness offers a good cover for the criminals. If a particular neighborhood is poorly lit, then chances are that it will draw in crime like no other place. This kind of a place is quite appealing for criminals such as burglars, thieve, and others to prey upon. Security service providers recommend marking these areas and then having then lit up. In most cases, properly working landscape lightings is sufficient to ward off risky behaviors in an area. People should have a visibility level of at least a hundred feet in all directions from their homes. This however can only happen if an area is sufficiently lit up. To scare away trespassers and potential burglars, it is recommended that functioning security lights be installed outside the homes. If possible, homeowners should also request that fully working streetlights be placed on the sidewalks and streets for additional lighting. The closest protection a homeowner has is his or her neighbors. By starting a neighborhood watch, homeowners can pull together a community that is able to effectively ward off risky behaviors or crime around their neighborhood. These communities are some of the best ways to protect one another from crimes such as vandalism, assault, robbery, break-ins and the likes. A well connected and alert community is better off security wise and much difficult to take advantage of. In simple terms, people with bad intentions are dissuaded from attacking this kind of a community. Once a neighborhood watch group has been instituted, meet on a regular basis to talk about the major security concerns. While at it, the neighbors should set achievable goals for improving the community as a whole. To help direct the neighborhood watch in the right direction, it is recommended to reach out to resources such as the local onsite security service company, police stations, and the likes. Security experts in these organizations are best placed to offer advice on where to get the needed security training or teaching for your neighborhood watch group. 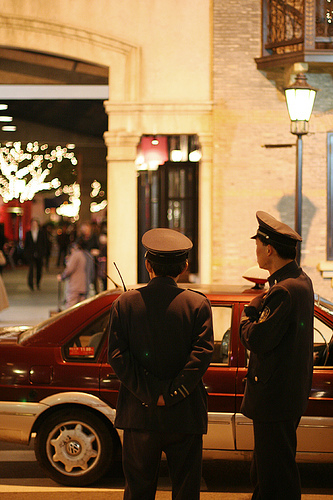 Hiring unformed onsite security guards is a great way to keep unwanted behavior far away in any neighborhood. These security experts are particularly helpful for neighborhoods that have experienced an increased level of burglary, vandalism and other crimes. By leaving the safety of your family in the capable hands of experienced and professionally trained individuals, you are ensuring the utmost level of protection and assuring your peace of mind. The best way to become an active member of your neighborhood is to attend events that draw people together. This also is a good way to establish a networking vibe that encourages community pride. Security service experts recommend community interaction as a great way to help identify people living together with an aim to develop a close-knit support system and know who might be trespassing. By knowing your neighbors, you will be able to easily identify trespassers or notice unusual activities around the neighborhood. Any unusual activity should be reported to the onsite security provide for remedial action. All in all, while criminal activities might seem unstoppable when they befall a given neighborhood, there are a number of effective ways to prevent and stop them as shown above. Whichever the case, hiring a properly trained and uniformed security force is highly recommended for neighborhoods that already are feeling the negative effects of criminal activities. And above all, get to know your neighbors and work together to help deter crime in your area. May it be for a friendly outing, first date, having quality time with the loved ones, etc, the silver screen has been one the most cherished past time in this country. Everyone loves visiting their local movie theater for fun and entertainment. Unfortunately, mass shooting incidents have changed the once fully carefree movie outing experience into a potentially worrying activity. These violent activities have become a serious security concern for movie theater owners and avid movie fans. As a result, a lot of people have become apprehensive being in certain public places, for instance, the pitch dark rooms of the movie theaters. Feeling insecure when in movie theaters has taken away the excitement and trill of watching a much waited for movie. Here are a few tips for both the movie premise owners and operators to help keep movie theaters secure. We had to pass through security to get to our apartment, because we are inside the carnaval street fair barriers. The person in charge of movie theater operations should be well prepared for all kinds of situations, including those they don’t like to think about, for example an attack threat on the patrons or the theater building itself. An emergency security plan that includes a way to secure or warn the patrons, evacuate people from the premises when need be, communicate your requirements for urgent assistance with onsite security service provider, medics, fire departments and the police is recommended. There should be pre-programmed business phone systems and emergency alarms that automatically notify your security guards, people in the premises for example employees and patrons , as well as the corresponding security authorities in case of a security emergency. These systems should be tested periodically to make sure that they are in proper working condition and are always reliable. Ensure that all aisles are free of people and their belongings when a movie is going on for security purposes. Apart from this make sure that the theater rooms are thoroughly checked and screened before and after a movie. In simple terms, make sure that all safety codes are clearly upheld by all in and around the premises. And while at it, make sure that emergency exists are unobstructed. Training the staff how to handle security emergencies on a regular basis drastically improves the way they respond in event of emergencies. These kinds of staff members are less likely to panic in event of security emergencies. They are able to react sharply and concisely against the expected chaos. Not only this, they are able to effectively assist the often shaken crowds. So conducting emergency drills on a regular basis is important as it becomes second nature to your employees. The staff must know every part of your emergency protocol, in particular who and how to call onsite security patrol or police back up when need be. To guarantee the safety of all that visit your premises, hire professional onsite security guards that specialize in Movie Theater guarding services. These kinds of people should all be uniformed to distinguish them from the patrons. Having these professionals around your premises is likely to intimidate potential attackers or ward them off your establishment. 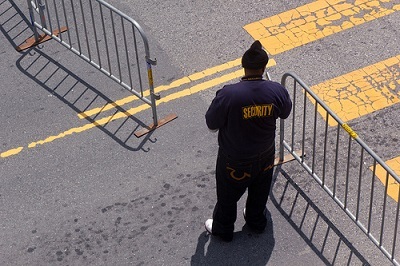 In case of a security emergency situation, the first people that form a line of defense against the attackers are mostly the onsite security guards. This might mean the difference between life and death for all patrons and employees within the premises. As such, make sure to hire a security service company that have professionally trained security guards as they have both the knowledge and training to do what is expected of them in event of security emergencies. It is always a good idea to keep crowds around a movie theater in manageable sizes. This makes it easier to contain them during an emergency. If this isn’t possible for your case, then make sure to hire extra security guards in anticipation of inevitable larger crowds, especially during movie premieres, weekends, summer blockbuster holidays and seasons. •	Parking the car in well lit areas. All in all, in event of an attack, the best way to defend yourself to stay as far as you can from the attackers. If this fails, then you will have to fight back. Be sure to strike at vulnerable areas such as the groin, eyes and likes while at it. Also remember, any item within your reach can be a powerful weapon to defend yourself with. If the attacker is stunned or subdued, use the chance to escape from the premises. What Does A Top Notch Home Security Checklist Look Like? Posted on: In: Blog | Comments Off on What Does A Top Notch Home Security Checklist Look Like? In recent years, people have beefed up their residential security due to any number of concerns. Some of them simply want to have a better rest at night and peace of mind where their security is concerned. In this regard, there are several things a homeowner can opt for to ward off security-related threats. Although the homeowner can take a number of measures to better protect his home, others are best left to the professionals. But whichever security beefing up step is taken, no single homeowner want to become the next target in a sudden increase in home burglaries or invasions by criminal elements. Now, let’s have a look at a good neighborhood security checklist that homeowners should follow to better protect their homes against break-ins and burglaries. In any given area, there are a number of local security companies that offer consultant services to the property owners. Use these experts to assess your residential neighborhood security requirements. These professionals are in a better position to understand the kinds of threats that plague neighborhoods such as yours. As such, they can easily identify security measures weak points and work closely with homeowners to strengthen their property’s defense. Having professional onsite security guard patrol at your premises can do a lot when it comes to preventing you from becoming a robbery statistic. The presence of security guards is often sufficient to deter attempted criminal activities in given area. As result, the home owner rest easier knowing that his property is well guarded by professionals at all times and that can respond within a moment’s notice to quickly resolve security threats. Where neighbors are watching out for one another, it becomes much harder for criminal elements to penetrate the community. In this kind of a scenario, neighbors are always on the lookout for unusual activities around the neighborhood. A good neighborhood watch program identifies the areas that could look welcoming to criminal elements and work with local authorities to install security lights for enhanced visibility. Security experts around the country recommend having a number of 40-watt lights strategically placed around the exteriors of a home to properly light up the dark areas and entranceways. A well-lit home’s exterior helps the local security patrol or police to better locate your home in event of an emergency. Criminal elements are less drawn to well-lit environments as their presence is easily given away. They prefer dark and poorly lit spots around the home so as to maximally take advantage of the situation. In event that the onsite security patrol or police have to be called, a homeowner would want them to easily and fast find his home. Having clearer displayed addressees is the best for this to happen. So be sure to clearly post your address in a visible and well-lit area on the outside of your home. This way, the police or onsite security patrol are able to quickly distinguish your home from the rest from a street level during the day or night. Any door that allows access from the outside should be made of strong and high quality materials. Besides, it should also possess a quality deadbolt lock in addition to a good doorknob key lock. When away from home or at night, this kind of a door should be kept closed and locked at all times. Also ensure that your exterior doors do not possess any glass opening or window within 40” of the door locks. Remember that if a door looks too difficult to break into, the majority of burglars will leave in search of an easier target. A good security expert will tell you it is never a good idea to answer the door without knowing who is on the other side. If your door doesn’t have a peephole or an intercom device, then it is time you installed some type or another. A peephole will allow for a wide-angle view outside while an intercom will permit you to converse with the person on the other side without necessarily opening the door. Note that once you open your door for a stranger, anything is possible in these days of serious security threats. Apart from door having the proper locks, the door frames need to be solid and snug. Apart from this the hinges also need to be the sturdy varieties for added security. The doors need to be correctly installed so that hinges are not accessible from the outside of the home. Make sure that the garage doors are properly closed before going away during the day or after driving back from errands. While on a vacation, have onsite security to patrol your property for added protection. While this is just a basic home security checklist, it can go a long way in helping to develop a safer place for you, your assets and loved ones. A little extra awareness from you coupled with the help of a good security patrol service can adequately prevent criminal activities from happening around your property or even your neighborhood.